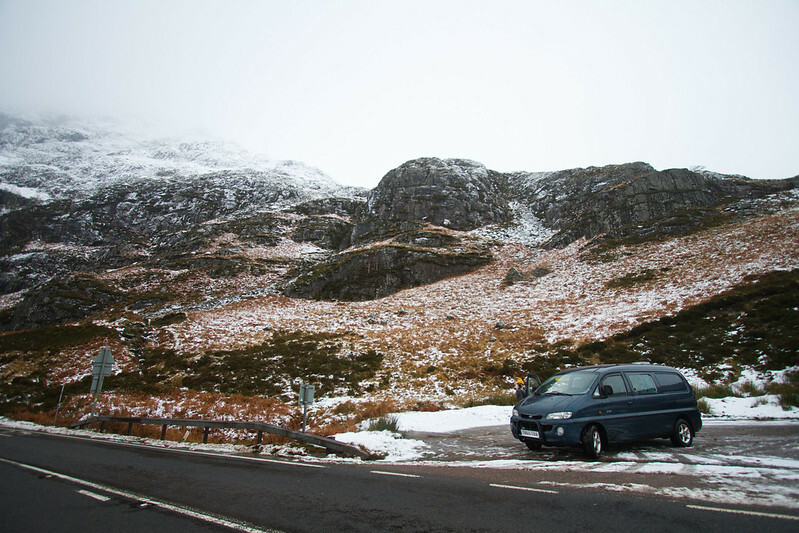 We originally purchased our van for around £2000, after a lengthy search trawling the internet for left-hand drive, automatic vehicles. 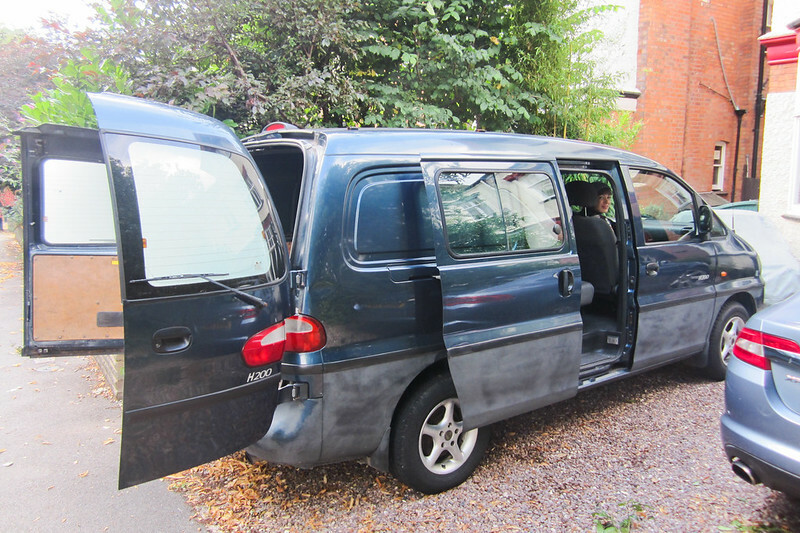 We ended up importing our Hyundai H200 from the Netherlands. 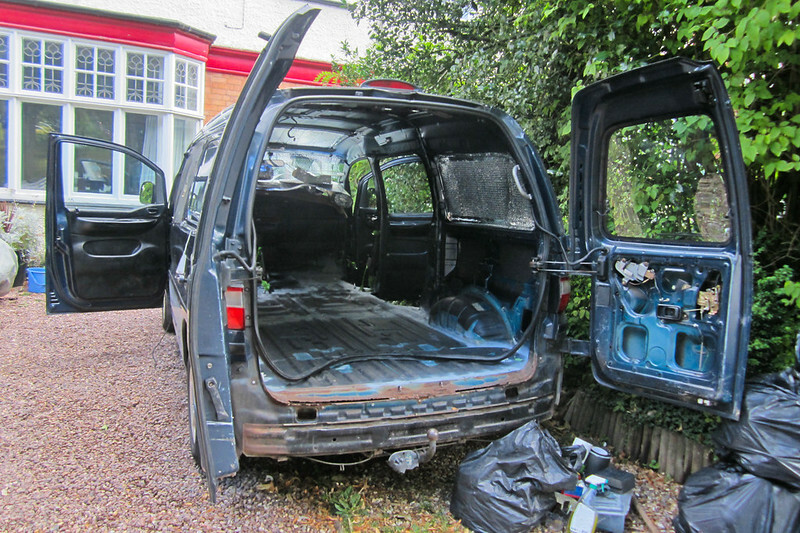 It was a huge project, below is some idea of what the van looked like at the very beginning. 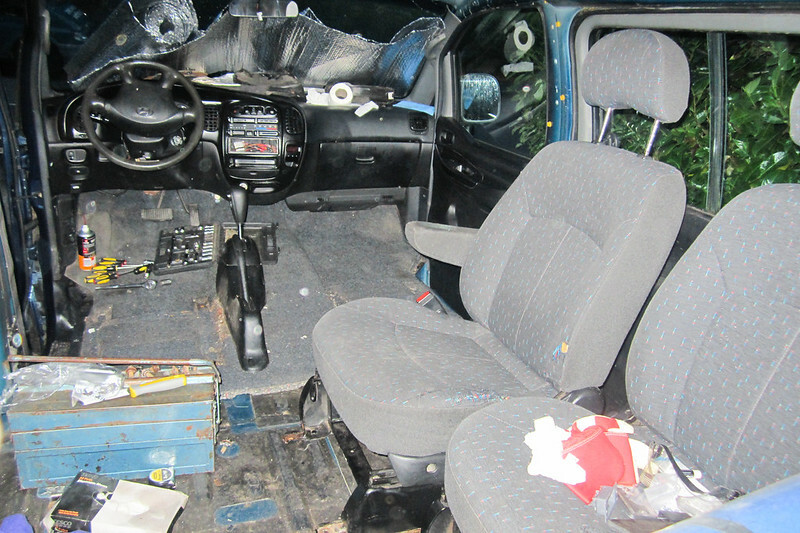 There were three bench seats in the back that we’d have to pull out, and behind the seats, a large plastic partition that we’d have to remove. 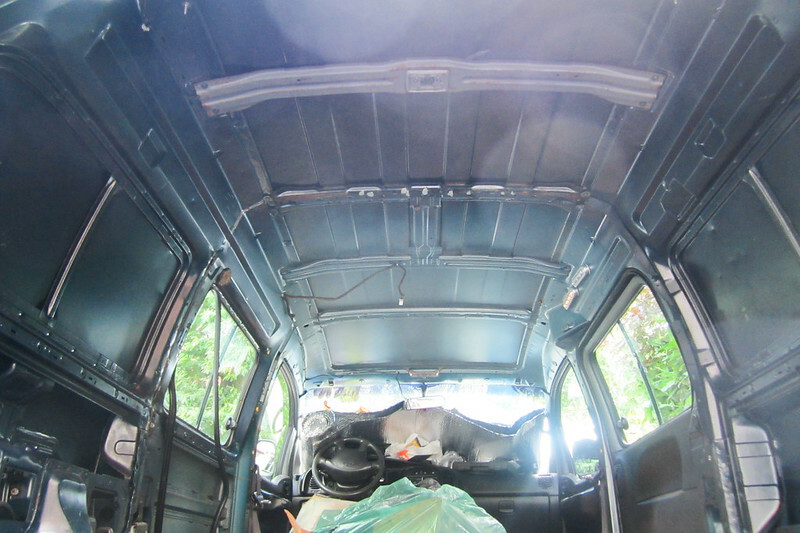 Firstly, we peeled off the plastic cloudy backing that covered the rear windows, pulled out the seats, and realized that the van required some amount of work on a number of large rust patches, and that we’d need to replace a leaky exhaust system, together with a few other engine bits and pieces. 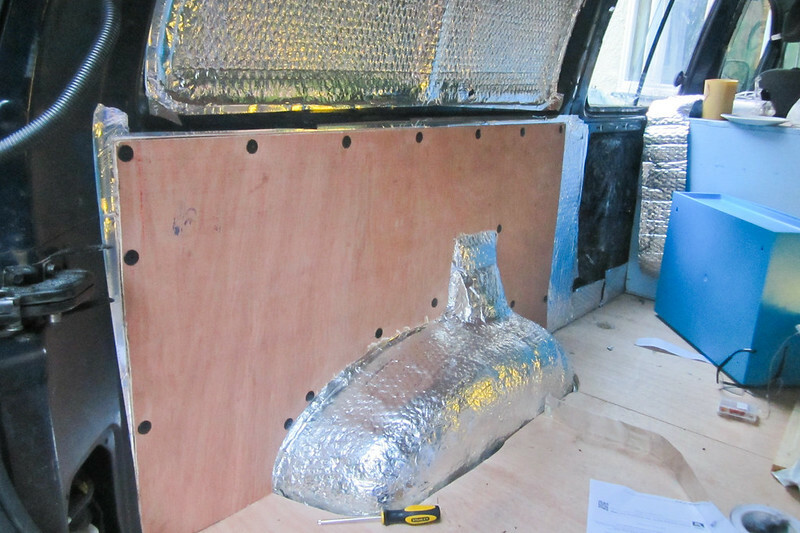 We then began the arduous task of pulling up the soggy floor and wall carpeting/panelling, so that we might be able to start insulating, and fixing any holes or interior rust issues. 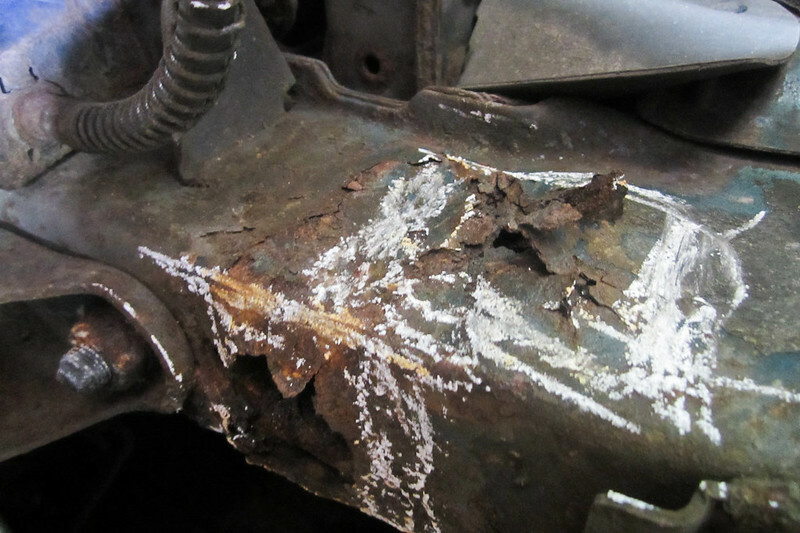 Underneath the floorboards, we discovered a strange black waterproof material that covered parts of the metal floor. We chose not to remove this, and decided that we’d build our floor around it, eventually. 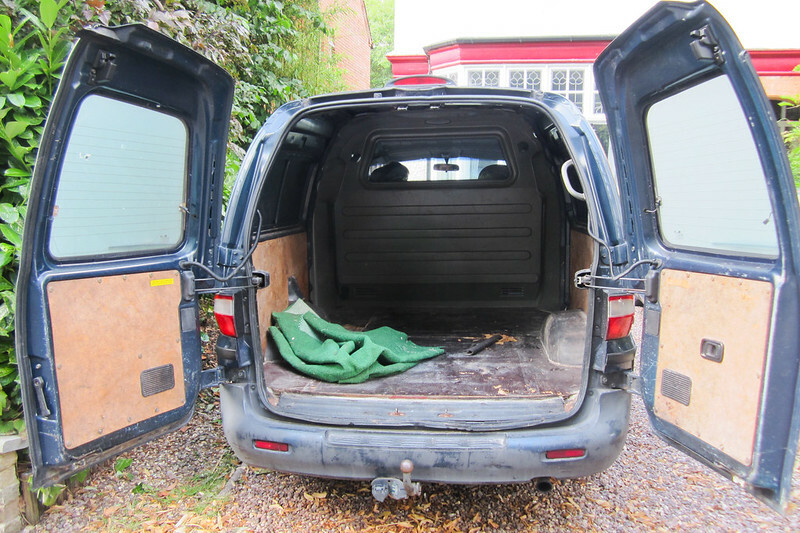 With the removal of the partition, we could begin looking at the van in it’s entirety. 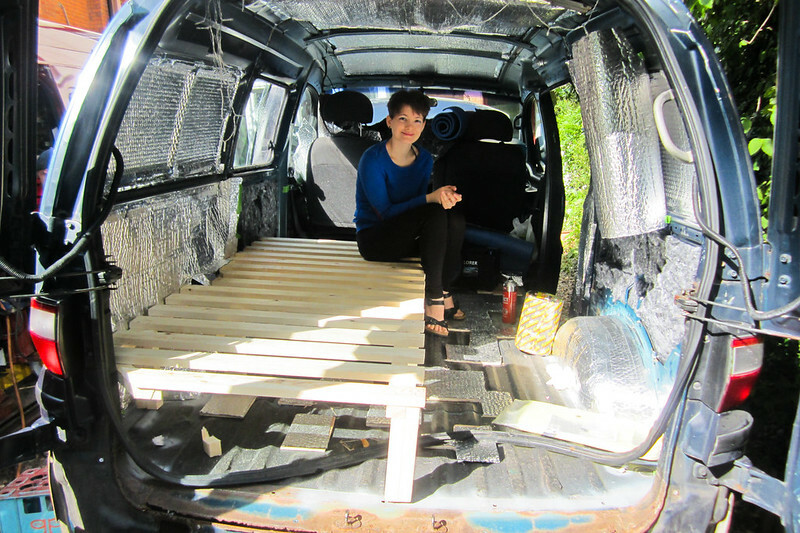 It was amazing how much space the van seemed to have gained, just with the removal of the partition. 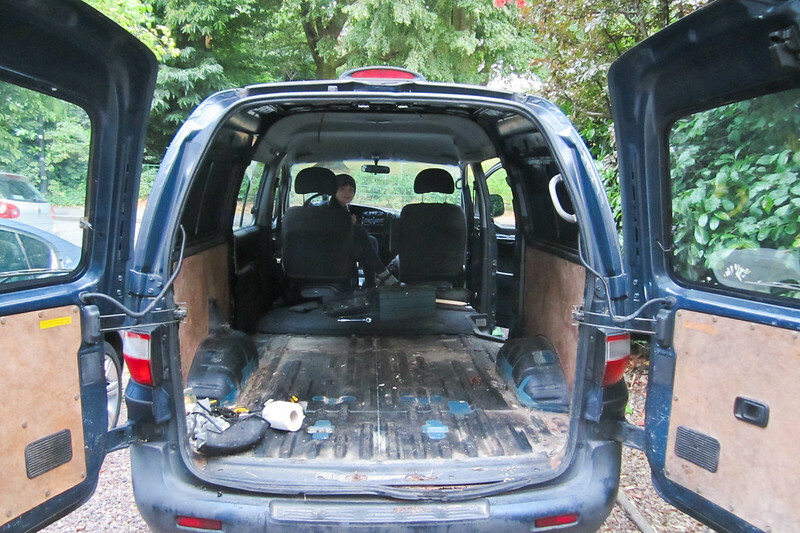 Now, with the van stripped of all of it’s panelling, rear seats, and carpeting, we could start building it up again. 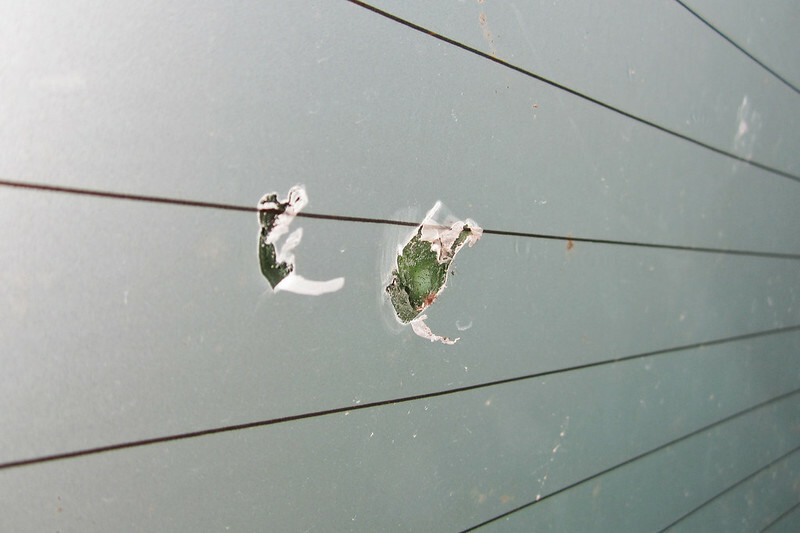 We’d begin with sealing, insulating, and fixing any exterior issues. 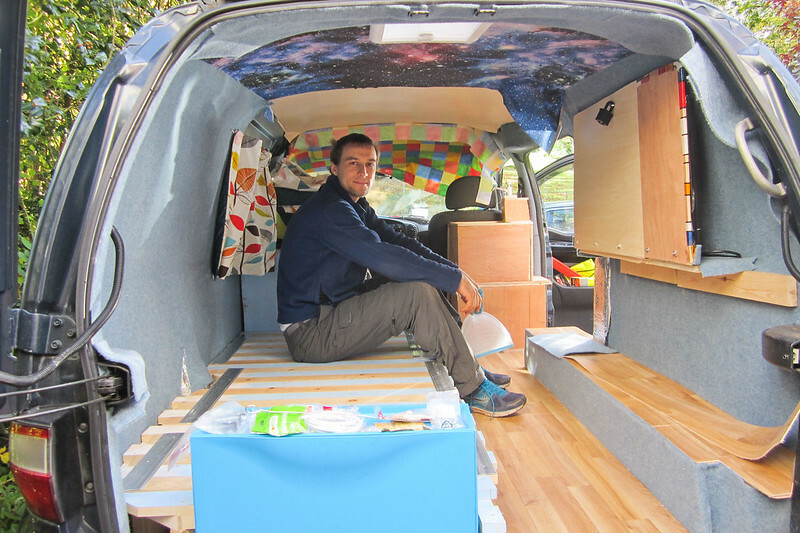 We began researching online, looking at how other people had converted their vans. 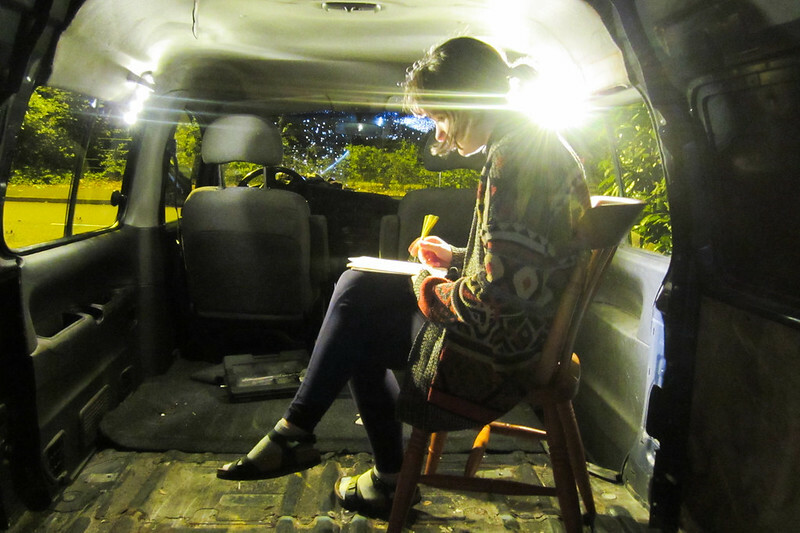 We drafted out sketches of what we imagined the van’s interior to look like, and we began creating lists of materials we needed. 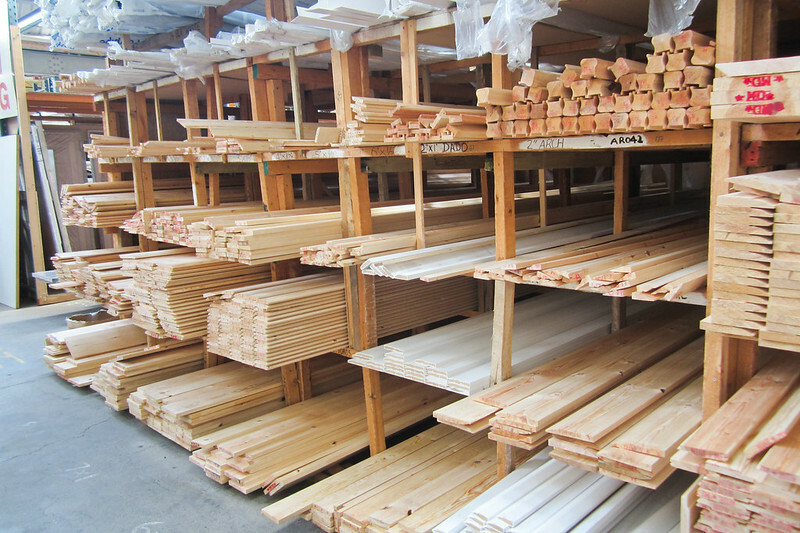 We purchased the vast majority of our materials from a local builder’s store, and Amazon, which both proved considerably cheaper than the larger DIY stores nearby. A collection of items bought during one of our first Amazon hauls! 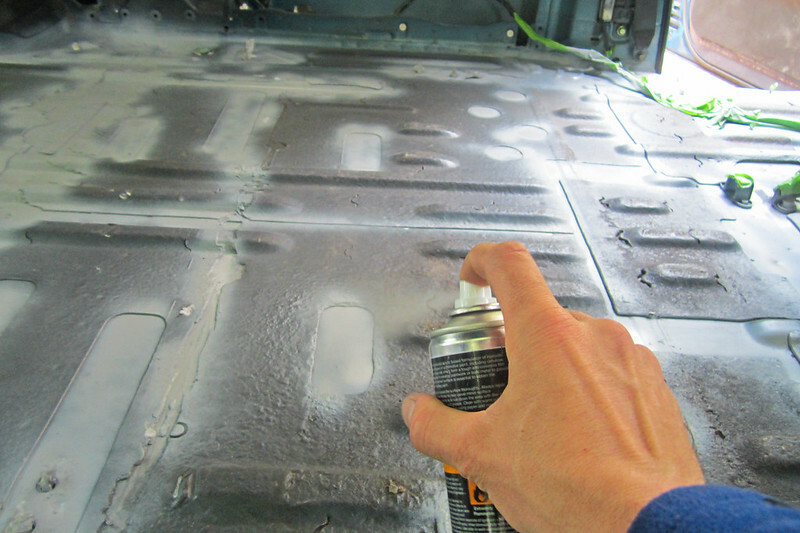 We planned to use Flashband during our insulation process, and we purchased a number of anti-rust spray-paints, coloured paints and glues. 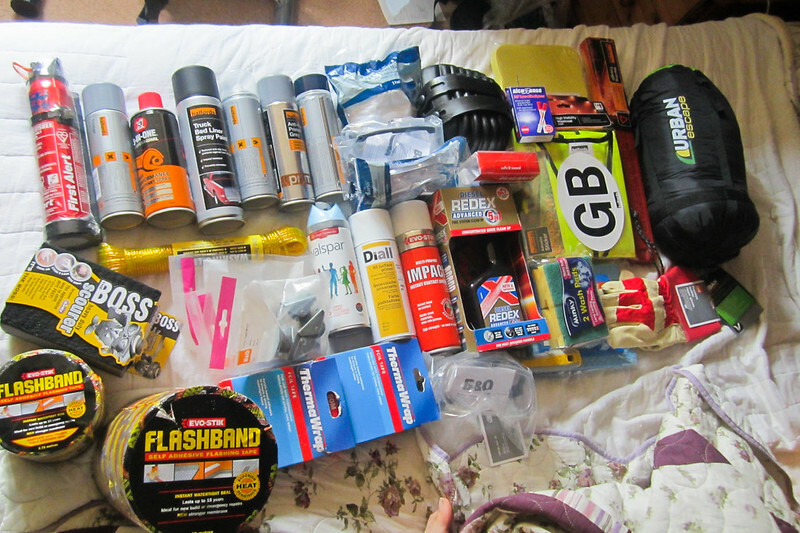 Amongst other things, we also bought a selection of equipment needed to drive around Europe legally. 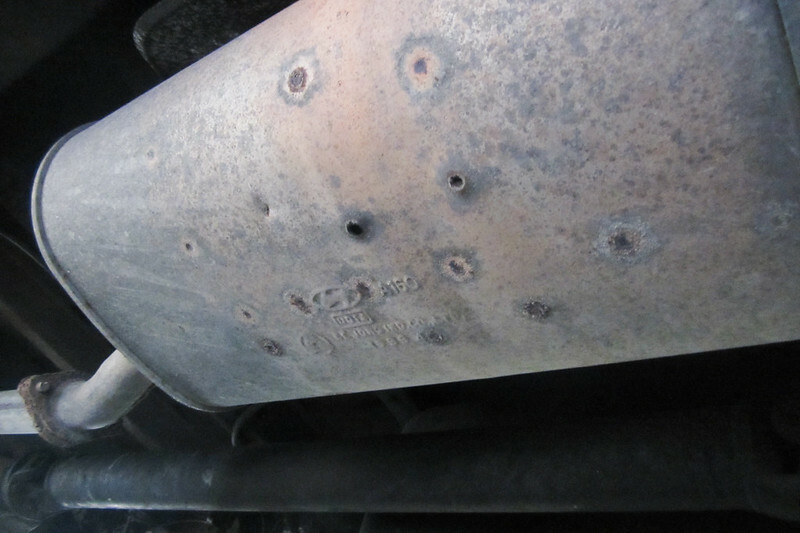 It was at around this point that we discovered the true extent of the van’s structural rust issues, when they caused us to fail an MOT. 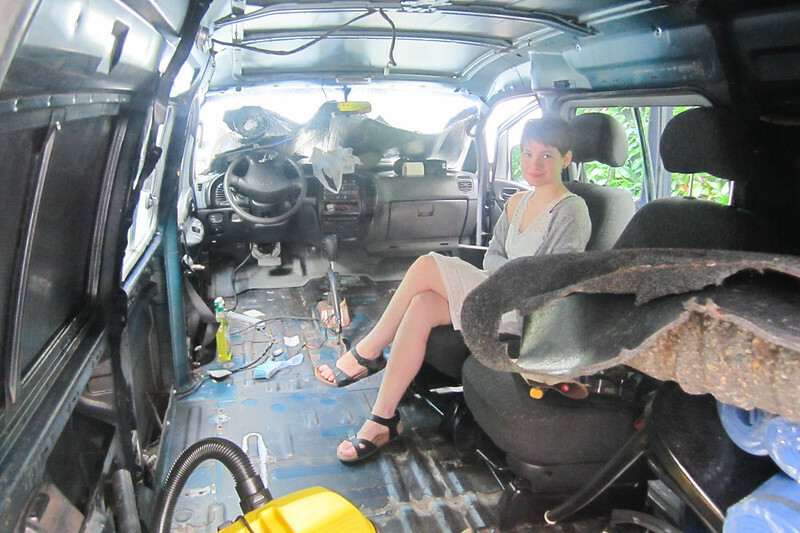 We didn’t have the time to send our van off to some welder, so we researched a mobile welder, who would come to our house and inspected our van. 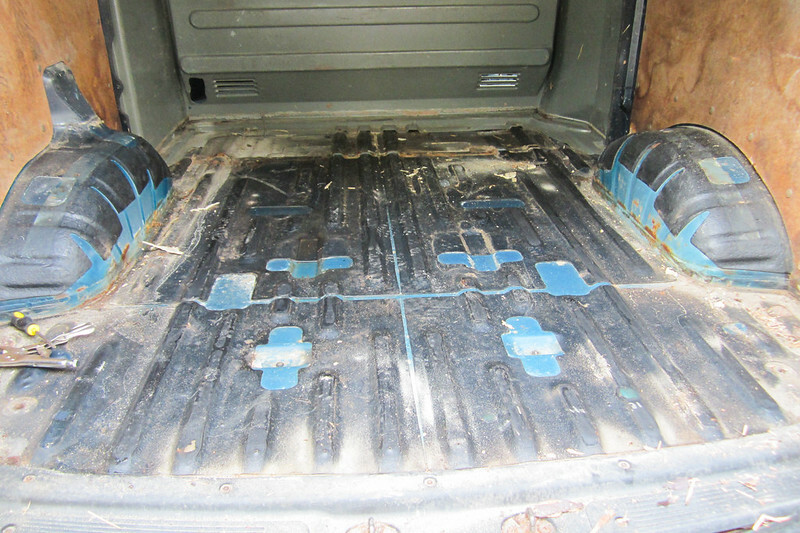 We removed the front seats, so that we could insulate under the carpet at the front too. 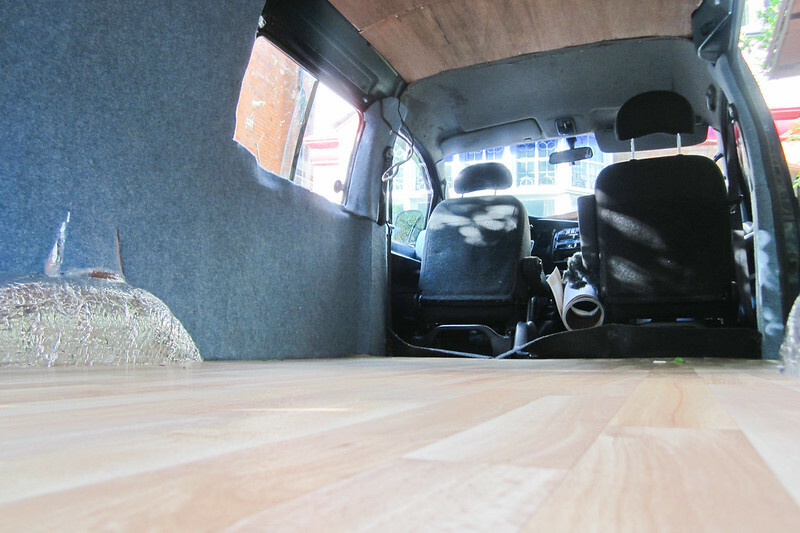 We’d add back the original carpet to the front, eventually, so we kept it safe. 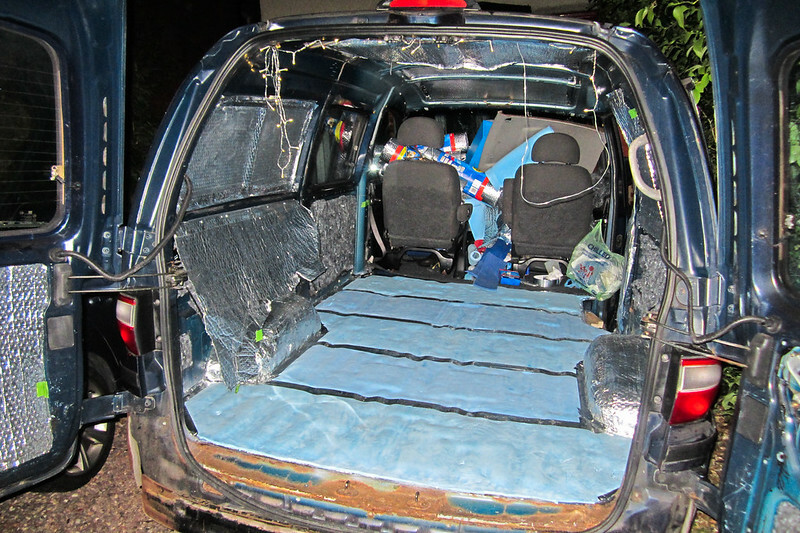 We started cleaning out the van, with natural orange spray, so that we could begin insulating. We removed the ceiling coverings, at the same time, so that we’d be working with what was, in our minds, at least, a metal box. 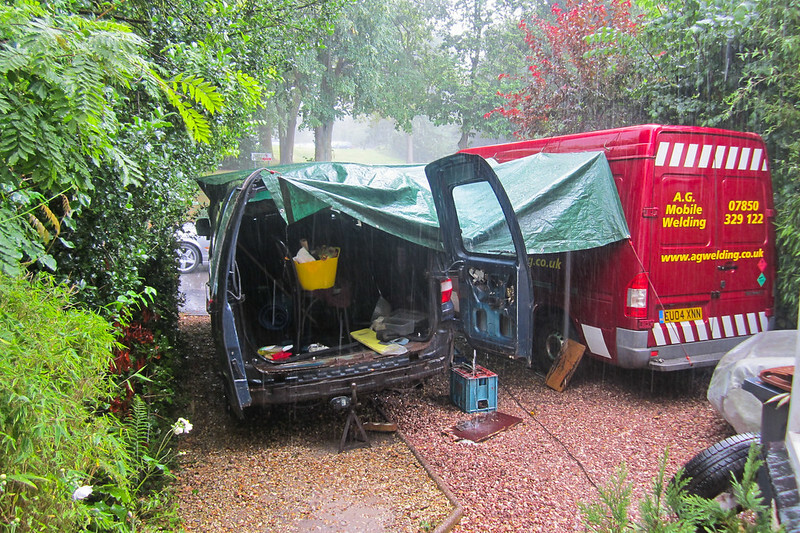 Typically for England, it rained during a large proportion of our van conversion. 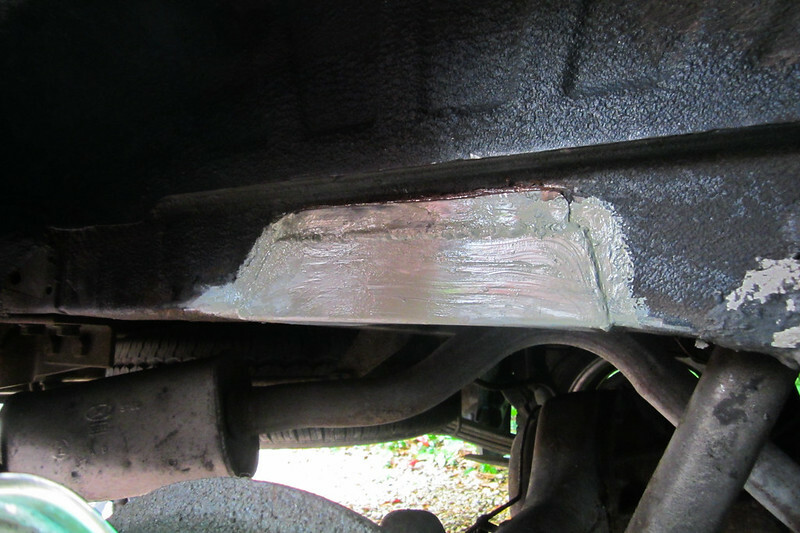 We started our welding, regardless, and over the course of a week or two, several large sections of the van’s underside were completely re-structured. 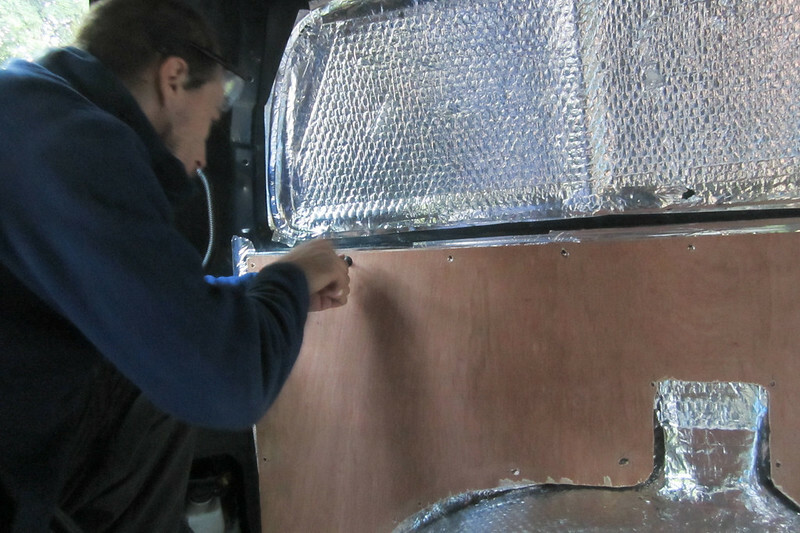 Whilst the welding was taking place, we started sticking Flashband to the walls, floor and ceiling of the van, in an attempt to soundproof the van a little. 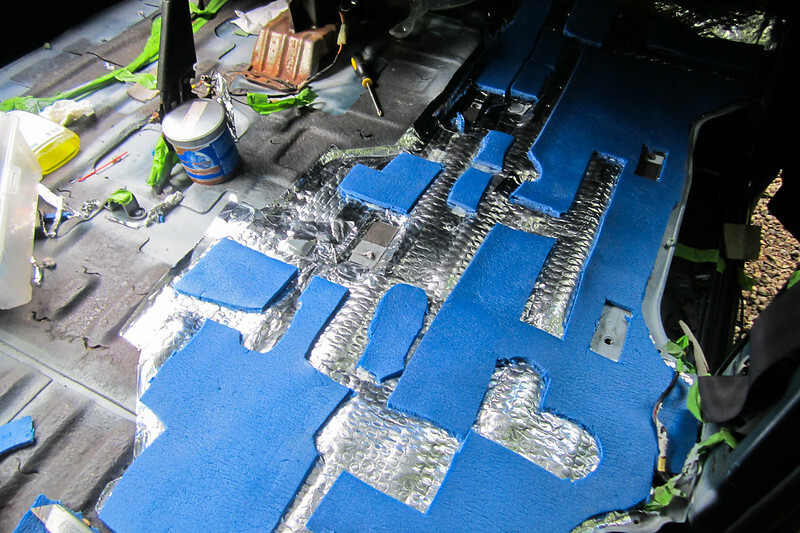 We then proceeded to tape Thermawrap to walls, and covered the floor in an anti-rust primer, so that there would be less possibility of our insulation getting wet. 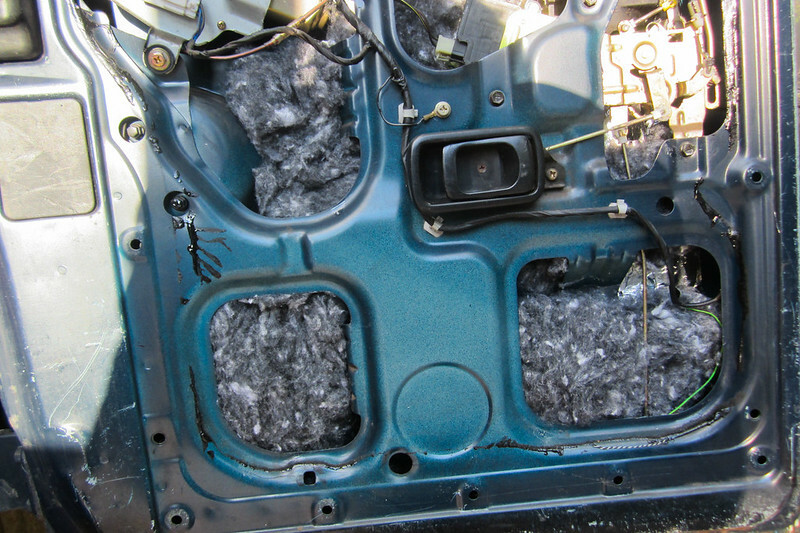 For extra insulation, we added a large amount of recycled plastic bottle insulation into the door panels, and really anywhere we could fit it. 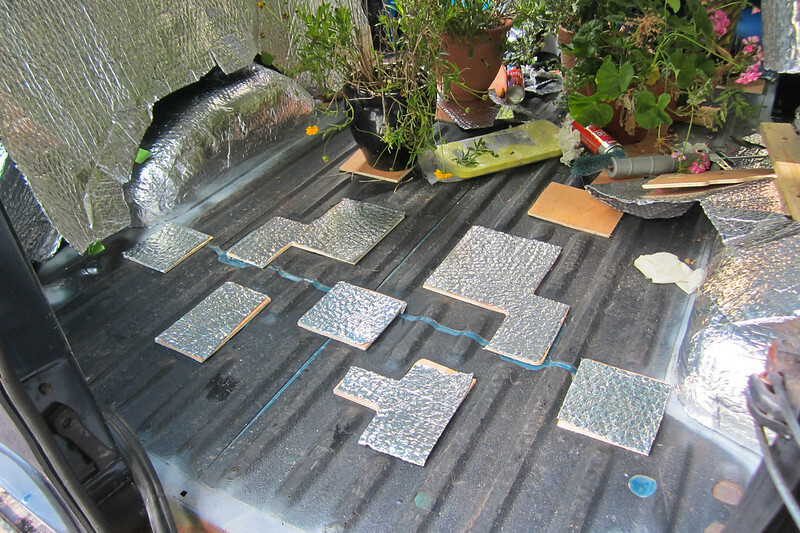 In an attempt to even out the floor, to create a flat surface on which we’d add linoleum, we cut out an abstract selection of shapes out of yoga mats and then, later, pieces of wood, which we glued down with Thermawrap. 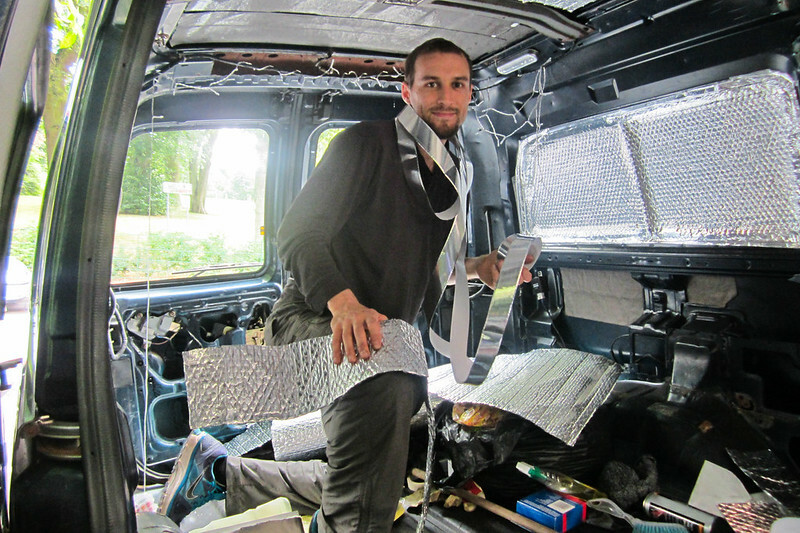 We are certainly not experts at insulating, and decided to insulate in the fashion we did after watching countless youtube videos. 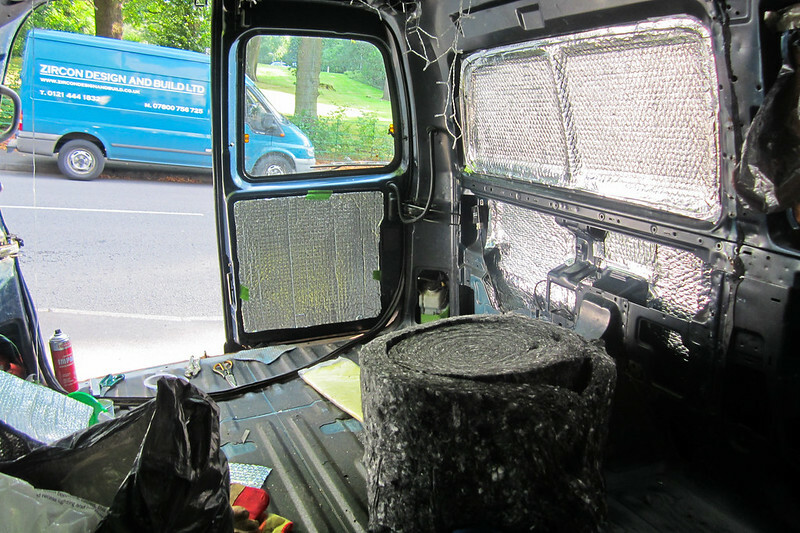 We’ve since read lots of accounts of people using Thermawrap, and similarly, we’ve read lots of people’s opinions on what is and what isn’t the right way to insulate. 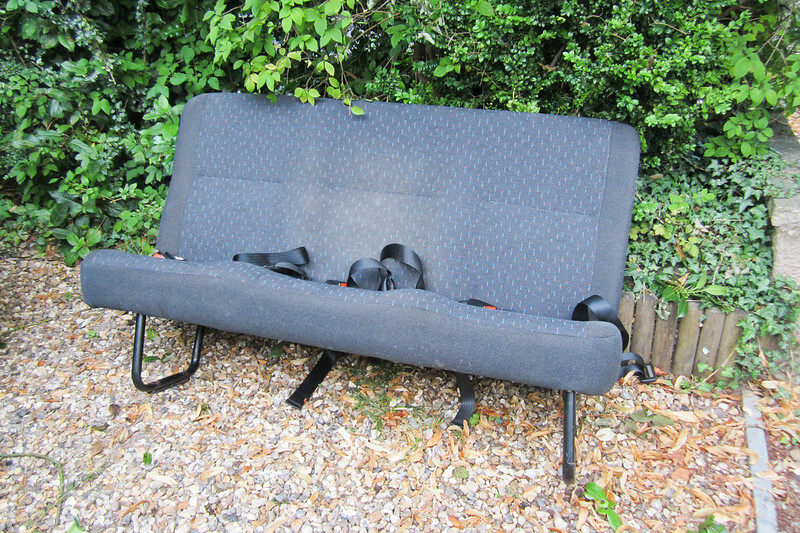 However, whether correct or incorrect, we found that our insulation kept us toasty even on the coldest night! For keeping warm, we had no complaints. 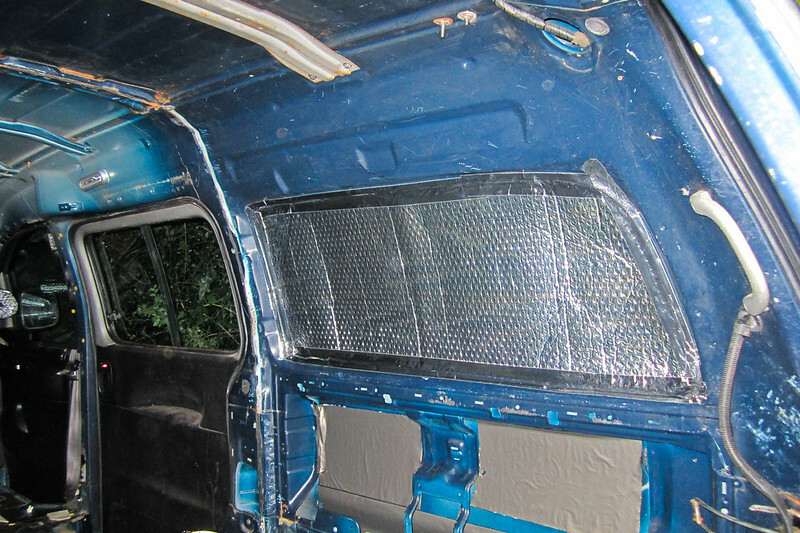 It seems to be a little more challenging keeping the van cool during the summer, if anything. Weighing our wooden blocks down with plant pots! 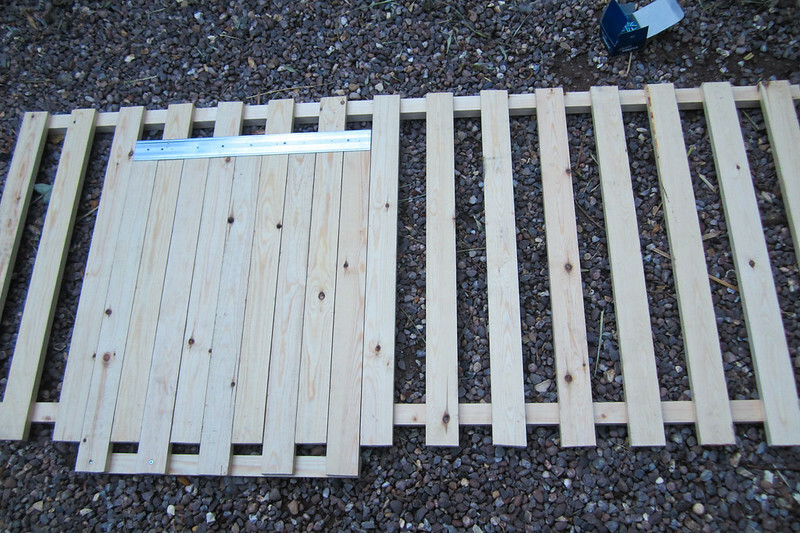 With the insulation well and truly under way, and our floor evening out, we could begin building our furniture. 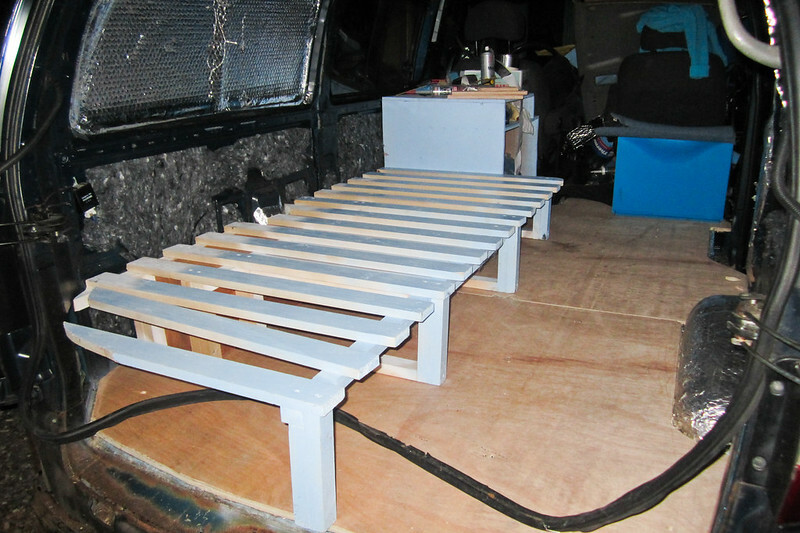 Mike crafted a slide-out bed with slats, that could be pulled out and into position every time the bed needed to be used. 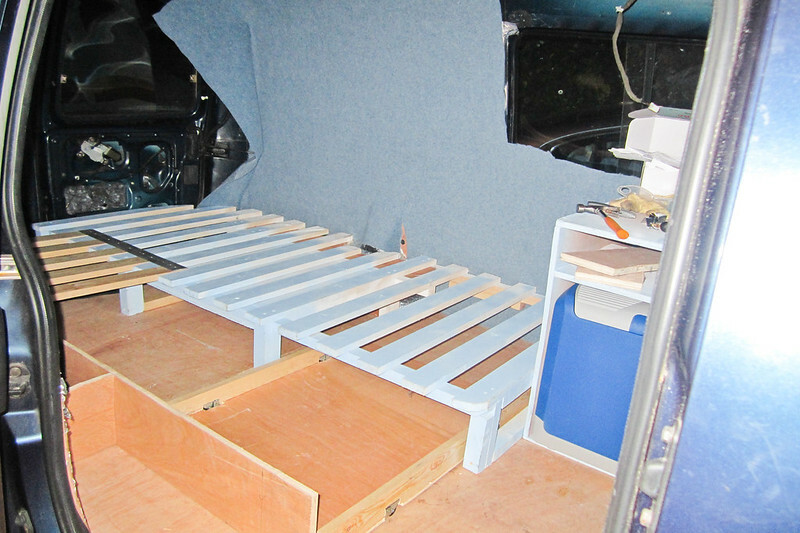 The bed was created so that it was just wide enough to cover the entire width of the van, and the height of the bed took into consideration the fact that we wanted to use the space under the bed for storage, together with the fact we wanted to be able to sit up at night. We added yoga mats to floor, once we’d evened out the surface, and then cut out large pieces of wood, which we’d cover with linoleum. 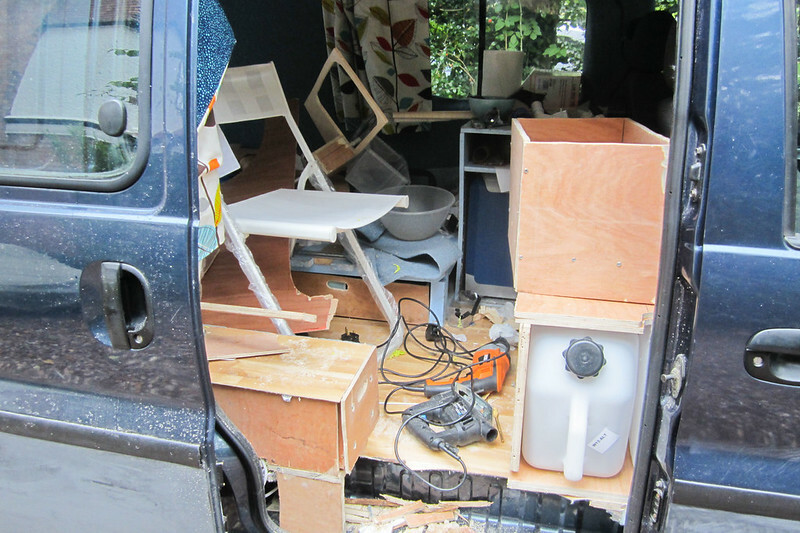 We designed a kitchen cabinet, and at this point started to really see our van as a liveable space – things were beginning to look a little less chaotic! 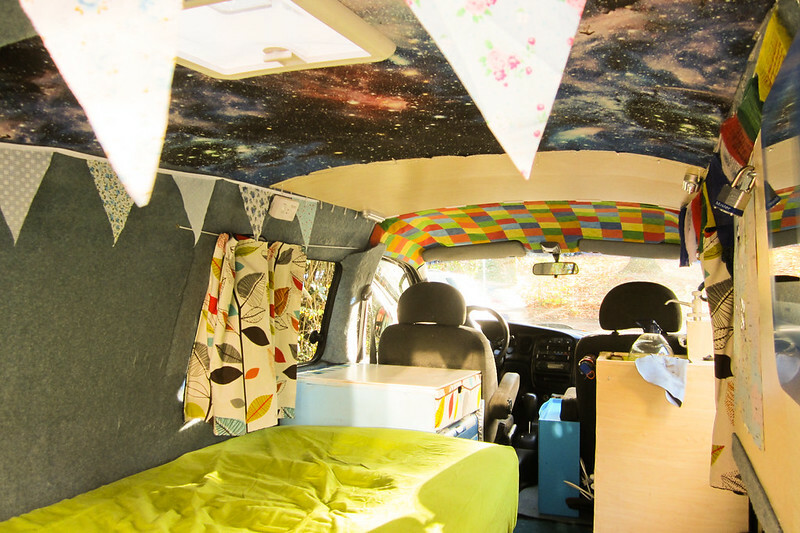 Now, we’d add wooden panelling to the walls, and slightly more challengingly, to the ceiling, too. 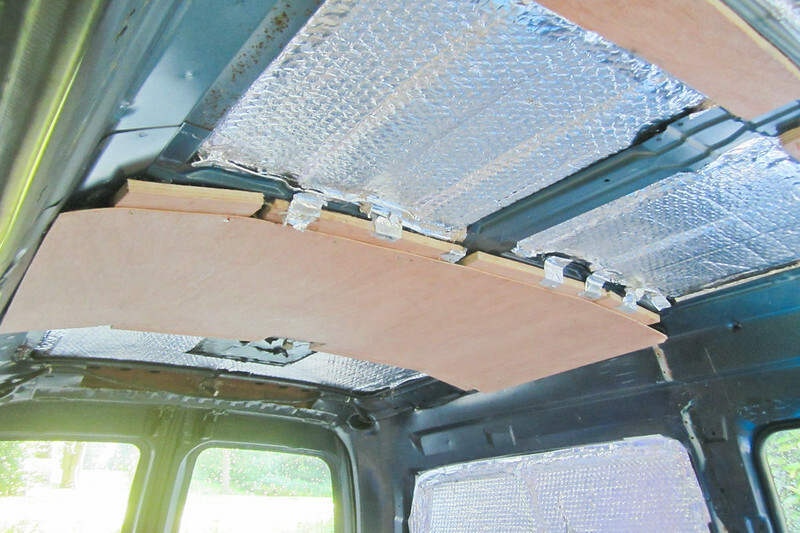 We attached our wooden panelling to the walls using strange Hyundai plastic screws, that we had to order from China and had great difficulty sourcing. After the panelling had gone up, we could concentrate on adding our carpet to the walls. 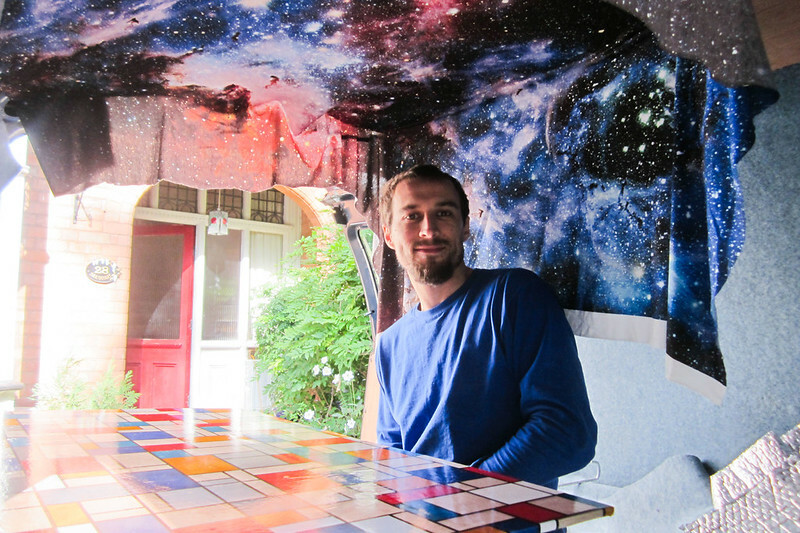 We attached the carpet to the walls using a campervan spray glue that came with the blue carpet we ordered. 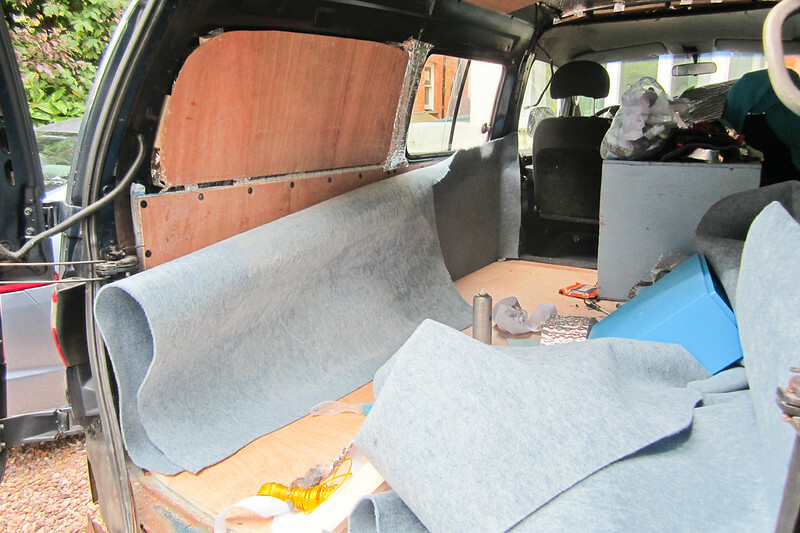 We cut out individual sections of carpet to fit various sections of the walls. We also added our linoleum to the floor at this point, too – it was difficult to cut into shape, we had to use an extremely sharp razor. We decided to install a table at this point, which we attached to the walls using wooden beams. We also installed a monitor stand, as we’d be editing a lot of photos on the road. 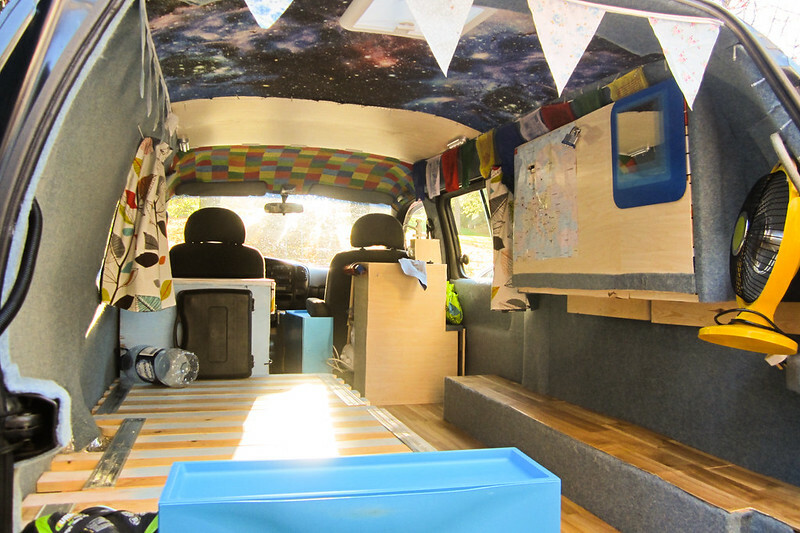 We also built a number of storage spaces for the wheel well areas, and under-bed roll out drawers. 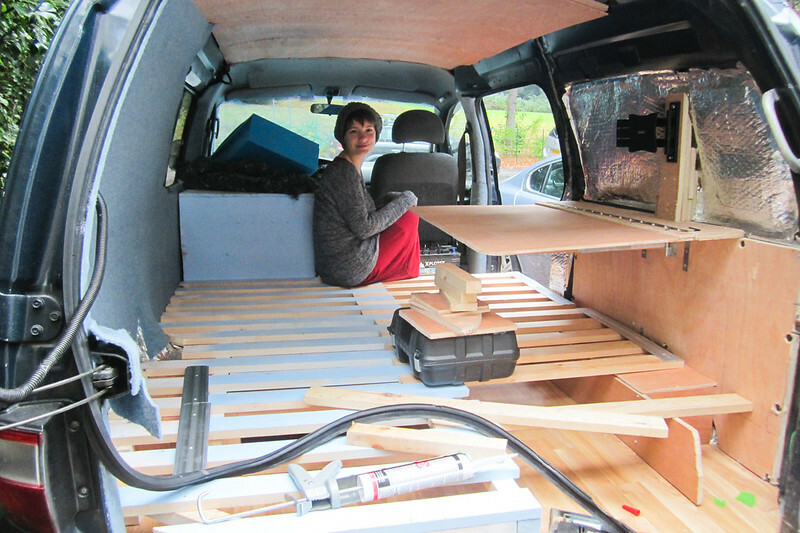 The very beginnings of adding decorations and colour to the van could begin! 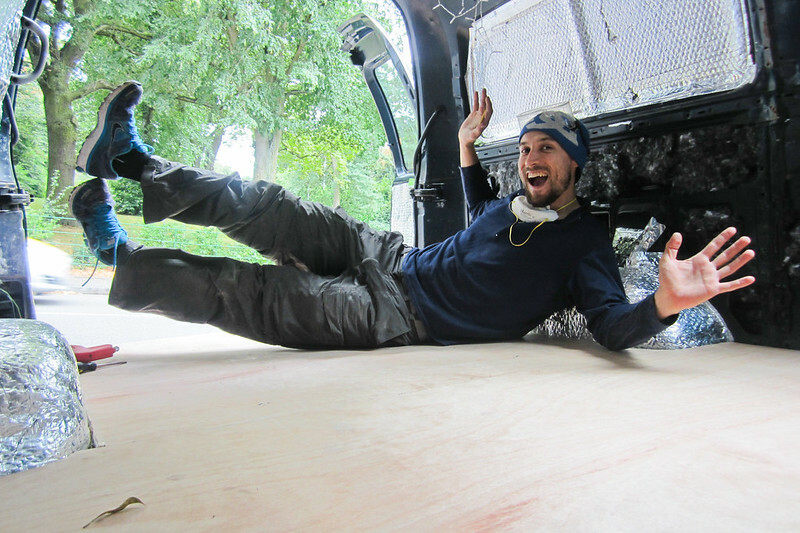 One of the more nerve-wracking moments of the van conversion was adding the vent to the roof of the van. 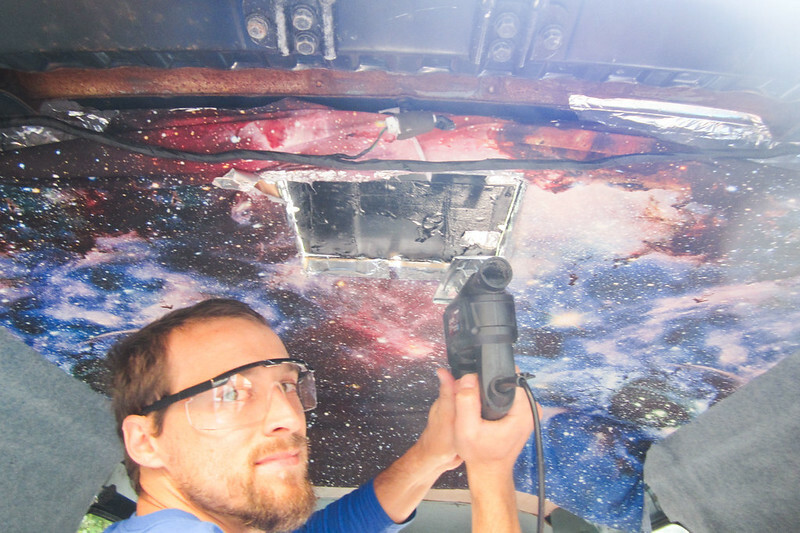 We measured, re-measured, and cut a vent-size hole into the van’s ceiling, and then installed our vent. 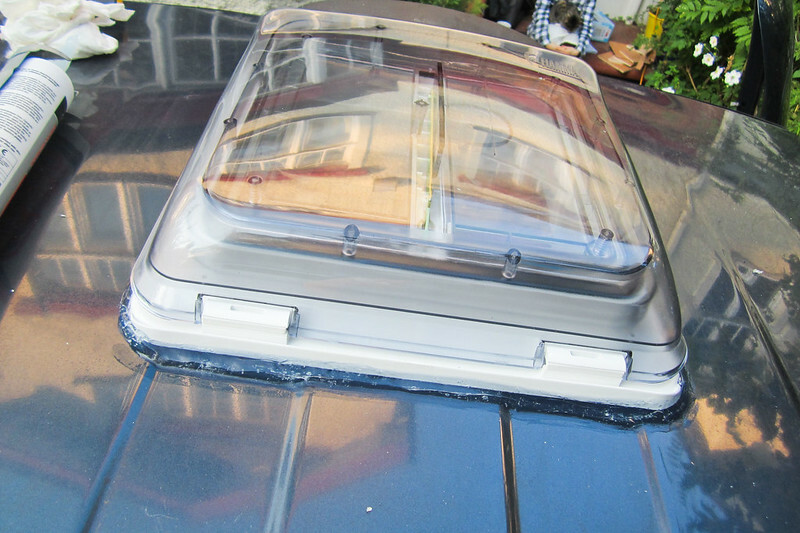 The vent turned out to be vital during our time in the van, adding a large amount of light and airiness to the van, whilst ensuring that we didn’t feel too claustrophobic when sleeping etc. 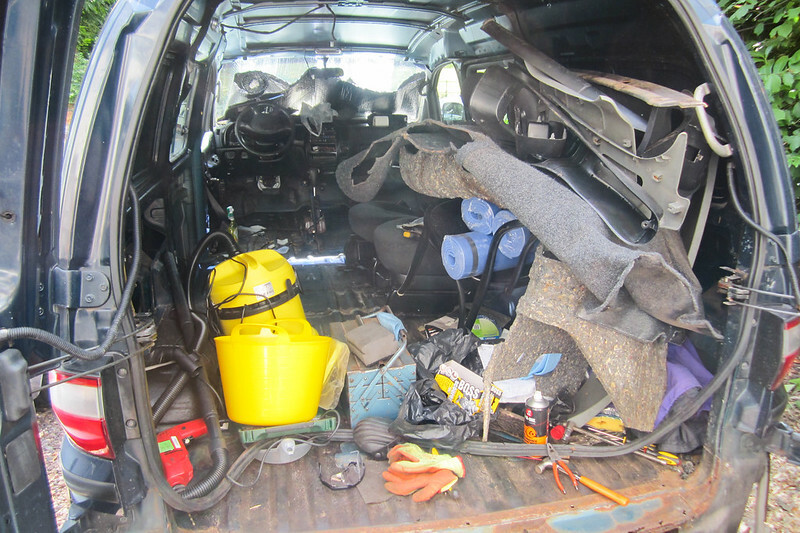 The last major piece of furniture to install was our sink, which we crafted out of mop buckets, wood, plastic covering and two large water tanks, one for clean water and one for dirty water, which can be pulled out of the van at any time. 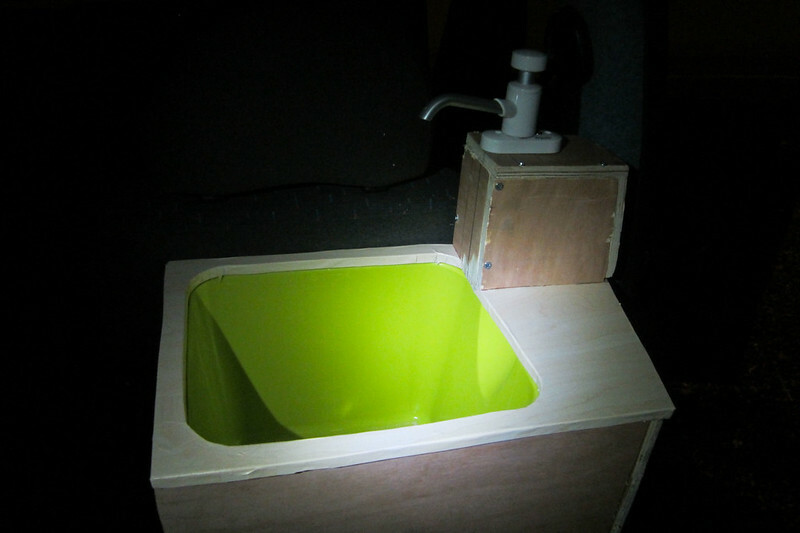 We installed a hand-pump to use with our sink. Now that all of the major pieces of furniture, the vent, and our walls, floor and ceiling were finished, we could start to concentrate on the finishing touches. This meant hand-sewing and velcro-ing our black out curtains, decorating, and adding in our two single mattresses to form our bed/couch. 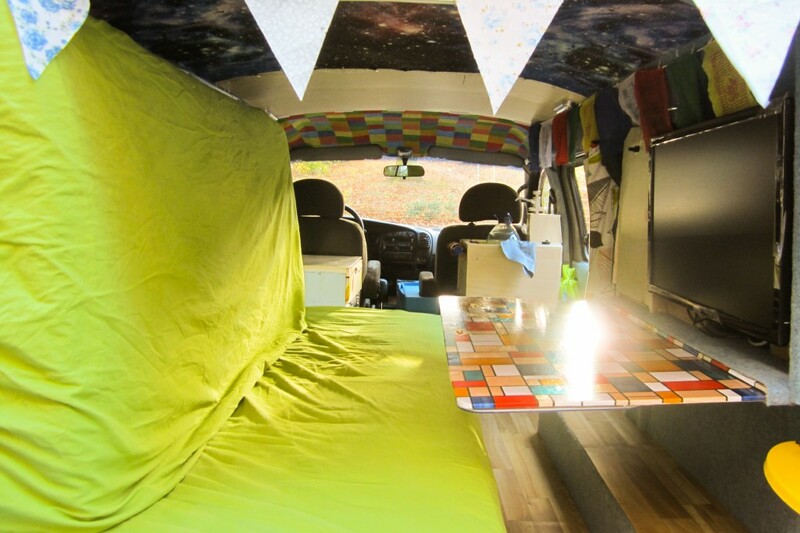 We also glued a tile counter to our kitchen cabinet, covered our ceiling in colourful materials, created cup holders and more storage space for between the two front seats, and installed our monitor, carbon monoxide detector, and other various bits and pieces. What a wonderful idea! How long did it take you to convert and how much dd you spend overall?